Russian Geographical Society’s award presentation. 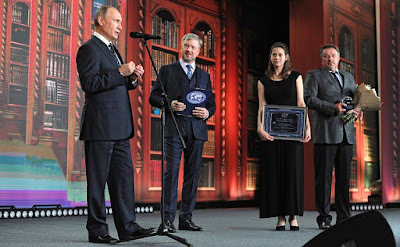 Putin.BLOG Geographical Society Russian Geographical Society’s award presentation. During the ceremony, Mr. Putin spoke briefly with two young geographers. Timofei Tsoi, aged 5, and Miroslav Oskirko, aged 9, took part in two TV programs, where they demonstrated extraordinary geographical knowledge. Timofei Tsoi has learned the names of all of the world’s countries and their capitals and recognizes their flags, while Miroslav Oskirko has been dubbed “the person with satellite vision” for his ability to recognize any country in the world or any Russian region by its outlines on the map. Later, the President visited an exhibition of works that won the RGO competition The Most Beautiful Country, which took place this year for the second time. Over 4.5 months, 23,000 photographers from Russia and abroad sent in more than 110,000 photos to the competition. The Russian Geographical Society award recognizes work in national geography, ecology, and preserving and popularizing Russia’s natural, historical and cultural heritage. The award is presented once every two years and has international status. It was first presented in 2014. Vladimir Putin - Geographical Society. Friends, let me say a bit more than would usually be said about this last category. First of all, I want to take this opportunity, which does not come up so often, to thank everyone without exception who is practically involved in the Russian Geographical Society’s life, everyone who under this wonderful organization's aegis carries out scientific research, lectures, environmental monitoring, search work and expeditions, everyone working in all the different categories. Of course, I also thank those without whom these projects could not go ahead – the trustees. You are all engaged in very important and tremendously interesting and fascinating work. Your work offers us examples of constructive and useful participation in our country’s life. I hope that the number of people taking up this kind of activity will keep growing. 0 Comment to "Russian Geographical Society’s award presentation."